This post is a classic of the blog: A hundredth post dedicated to show which were the most and least read of the first 300 posts. (I wrote two just posts when I reached the first 100 and 200 posts in the blog). Since I started the blog in February 2010, the blog has received over 65,000 visits and hundreds of comments. 1. Will Boeing 787 ever break-even? 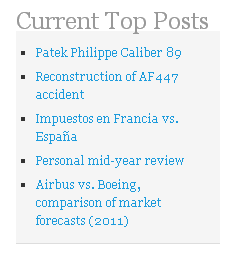 Comparing the lists to the previous 2 years ones: 7 posts of the 10 most read ones in 2011 are still there while only 2 remain from the most read after the first 100 posts. On the least read ones: 6 were in the list after 200 while only 3 in the list after 100. Brain drain or bank run? A curiosity that comes with having a blog is that sometimes certain post starts to be read more and more and you keep wondering why. One plausible reason is clear and self-fulfilling: since the most read posts in the last few days appear at the right of the blog, readers may opt to read one of those after having read the post that brought them to the blog. One of those post that it’s being read more and more recently is a comparison I made about income tax rates between Spain and France. I wrote it because I had some work colleagues who asked me about that, and instead of writing always the same answer I could refer them to the blog post. Stats of the post related to France income taxes. In this particular case, and since the post it’s written and titled in Spanish, I decided to check the stats with the dates of the announcements of the bail outs of Bankia and Spain. Another thought I have is: since the title is relatively vague “Taxes in Spain and France” (it does not mention “income” even if it only refers to income taxes), this keeps me wondering whether people arriving at this post are tempted to emigrate from Spain or to relocate their savings… brain drain or bank run? Sigh (as in lament). To have a better view on that, and taking into account that my blog is not a special reference nor its low readership is representative of Spain, we could simply check with Google Trends. I started to look for it, but Google’s answer was “Your terms […] do not have enough search volume to show graphs”. Sigh (as in relief).